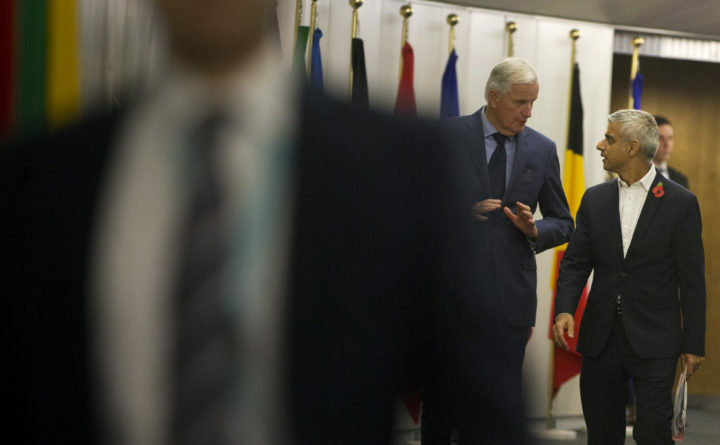 European Union chief Brexit negotiator Michel Barnier, center, speaks with London Mayor Sadiq Khan prior to a meeting at EU headquarters in Brussels Friday, Oct. 26, 2018. It was either ignorant or irresponsible for those campaigning for Brexit (British exit from the European Union) two years ago to claim that the Irish border would not be a problem. In fact, it may lead to a catastrophic “no deal” Brexit in which the United Kingdom crashes out of the EU without an agreement of any kind. Both the British negotiators and their EU counterparts say the deal is “95 percent agreed,” but the other 5 percent is the border between the Republic of Ireland (an EU member ) and Northern Ireland (part of the UK and therefore soon NOT part of the EU). Time is running out, and agreement on that last 5 percent is far from certain. It was a brave, imaginative deal that has given Northern Ireland 20 years of peace, but it is now at risk. When the “Leave” side narrowly won the Brexit referendum in the UK and Theresa May replaced David Cameron as prime minister in 2016, she had a credibility problem. Like Cameron, she had supported “Remain,” but the Conservative Party she now led was dominated by triumphant Brexiters. So she became an enthusiastic Brexiter herself. The English nationalists who ran the Brexit campaign had said nothing about leaving the EU’s “single market” and customs union, but within weeks of taking office May declared Britain must leave both of them. She even made this demand part of her famous “red lines,” the non-negotiable minimum that the British government would accept in the divorce settlement. Unfortunately, ending the customs union would mean re-creating a “hard” border between Northern Ireland and the Republic – and that might lead to a renewal of the sectarian civil war between Catholics and Protestants in the North. So the EU suggested a “backstop.” If London and Brussels can’t come up with a free-trade deal to keep the border soft (i.e. invisible), then Northern Ireland could stay in the customs union, and the rest of the UK could leave. The real border, for customs purposes, could run down the middle of the Irish Sea. Theresa May actually signed up to this solution last December, because the only real alternative is a hostile Brexit that simply ignores the EU’s position. But no sooner had she agreed the “backstop” with the EU than rebels in her own camp – extreme Brexiters and members of a small Northern Ireland-based Protestant party whose votes are all that keeps the Conservatives in power – forced her to repudiate it. Now May’s position is pure fantasy: no customs border with the EU either on land or in the Irish Sea. Which is why the probability of a chaotic “no deal” Brexit is growing daily, and the prospect of renewed war in the North is creeping closer. Is renewed war really possible? Last year Sinn Fein, the leading Catholic party in Northern Ireland, withdrew from the “power-sharing” government mandated by the Good Friday agreement. That could be seen as clearing the decks for action once it became clear that Brexit would undermine all existing arrangements in Ireland. And if the UK crashes out of the EU without a deal, the ratings agency Standard and Poor’s predicted on Tuesday, unemployment in the UK will almost double, house prices will fall by 10 percent in two years, and the British pound will fall even further. First impoverishment for the British, then war for the Irish.